Postal regulations are complex and are constantly changing, we encourage you to call us in your early project planning stages to receive guidance on the most effective ways to minimize postage and processing costs while maximizing deliverability. You can also refer to our Mail Piece Design 101 booklet for more information. Fill out the Request for Mail Preparation Services form (online). You may also download and submit the Mail Prep PDF form. Submit an electronic file of your mailing list or request use of a general mailing list. Provide your material for mailing or have Printing Services or Copy Services deliver material to Mail Preparation Services upon completion. 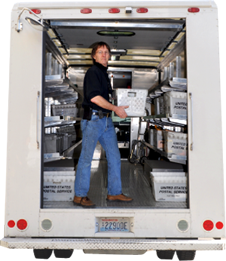 Get Started by contacting Mail Preparation Services. Also, see our quick guide on mail prep rates. Inkjet addressing equipment gives you professional-quality addressing and messaging efficiently and at a very low cost. You can even add a logo, short message or choose from a number of type fonts to match your message and audience. To Get Started, see our inkjet addressing page. Mail Preparation will take care of all regulations to meet this certification and then will use your electronic file to address your mailing with direct ink jet printing onto your material. Contact Embay Lee at addrfile@u.washington.edu before starting to build your mailing list. Or read details on mailing lists and submitting electronic files. We can also provide custom printing of stationery, envelopes, and Business Reply Mail. To get started contact your Account Manager.